Strawberry is one of the most consumed fruits owing to its fragrance, taste, antioxidant capacity resulting from high levels of anthocyanins, and other nutritional properties . Cultivation of the strawberry has greatly increased, and this fruit has become one of the most cultivated fruit crops worldwide. However, the provision of a sufficient quantity of true-to-type plants for commercial production is challenging. Conventional propagation by runner segments limits the number of propagules, and the obtained propagules are susceptible to plant diseases such as those caused by fungi , Strawberry mottle virus (SMoV), and Strawberry mild yellow edge virus (SMYEV), which gravely threaten strawberry production . In vitro propagation techniques using different explant types, such as node cultures  and leaf, sepal, and petiole explants [5–7], have been widely implemented for efficient strawberry production. Unfortunately, strawberry plants obtained through tissue culture are pliable to genetic variations in the field, exhibited by changes in growth habits such as greater branching, vigorous vegetative growth, and greater number of crowns and runners when compared with conventionally propagated plants [8–10]. Meristem culture has been used for the production of disease-free strawberry plants from infected plants [11, 12]. Recently, Munri et al. conducted successful in vitro propagation of different strawberry cultivars from meristem cultures. However, meristem-derived plants also show morphological changes under field conditions [14–16]. 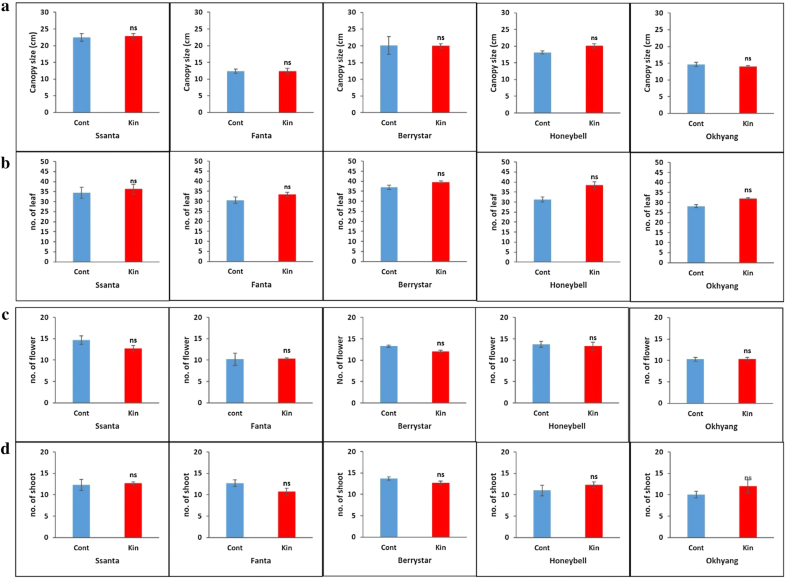 Occurrence of such variation in tissue culture-derived plants seriously limits the utility of the in vitro propagation system. 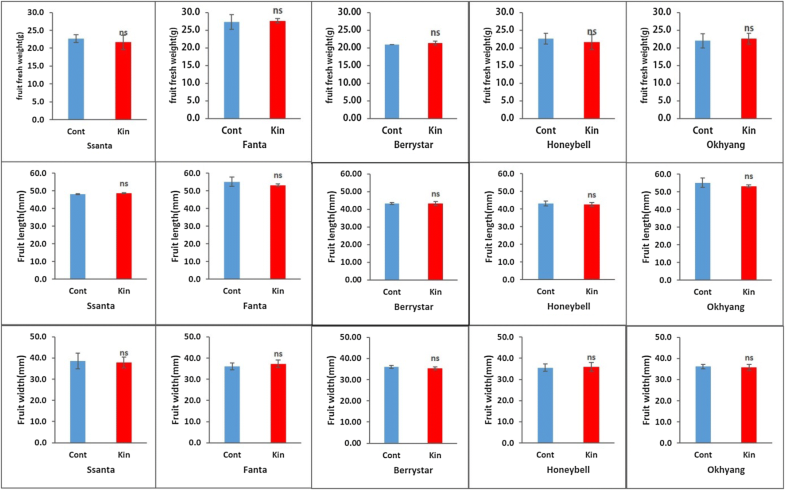 In vitro propagation systems using different types of explants and plant growth regulators have been developed for reproduction of strawberry [6, 7, 13, 16, 25, 26]. However, there have been no reports describing propagation systems for Santa, Fanta, Berrystar, Honeybell, and Okhyang, the cultivars commercially grown in Korea. Genetic variation in tissue culture-derived plants can be induced by the application of higher concentrations of cytokinins, frequent subculturing during proliferation, and the choice of genotype [16, 17, 19–21]. Hence, by implementing these findings, we established an efficient in vitro propagation protocol for reproduction of these five cultivars (Santa, Fanta, Berrystar, Honeybell, and Okhyang) from the meristem to obtain genetically stable and virus-free regenerated plants, the properties preferred by commercial growers. Greenhouse performance of the meristem-derived plants was compared with that of plants conventionally propagated from donor plants grown in a greenhouse, and the stability of fruit quality was evaluated for three continuous growing seasons. 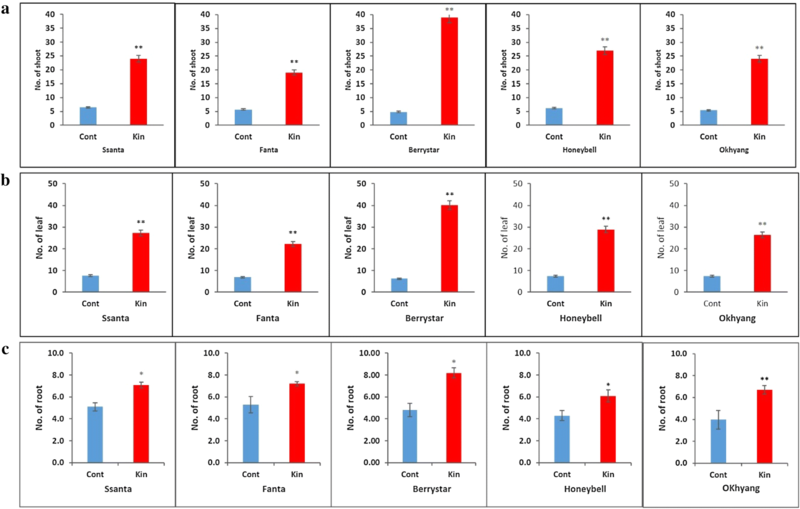 In comparison with conventionally propagated runner plants, meristem-derived plants with somaclonal variations exhibited changes in growth habit, runner production, and other vegetative and sexual characters [14–16]. Nehra et al. reported that meristem-derived plants of the strawberry cultivar Redcoat produced more flowers and fruits than conventionally propagated plants. In the present study, the meristem-derived plants and conventionally propagated plants cultivated in the greenhouse for three growing seasons did not differ in canopy size, number of leaves and shoots, number of flowers per plant, and fruit quality attributes such as single fruit fresh weight, fruit width, fruit length, fruit firmness, and total sugar content. These results were attributed to the genetic stability of the meristem-derived and conventionally grown plants. Taken together, the results presented herein indicate that Kn at a concentration of 0.5 mg L−1 efficiently induced the growth of genetically stable plants from the meristem. These plants were morphologically stable and virus-free when propagated and grown under greenhouse conditions for three continuous growing seasons. The method used in this study can therefore efficiently induce genetically and morphologically stable shoots from meristems, a major difference compared with the results of previous studies. We expect that this novel method can ensure a continuous supply of strawberry fruits with stable quality to markets. Moreover, from the economical point of view, this approach eradicates virus diseases that cause serious yield losses in every growing season. 13007_2019_421_MOESM1_ESM.docx Additional file 1. List of primers used for RAPD analysis.